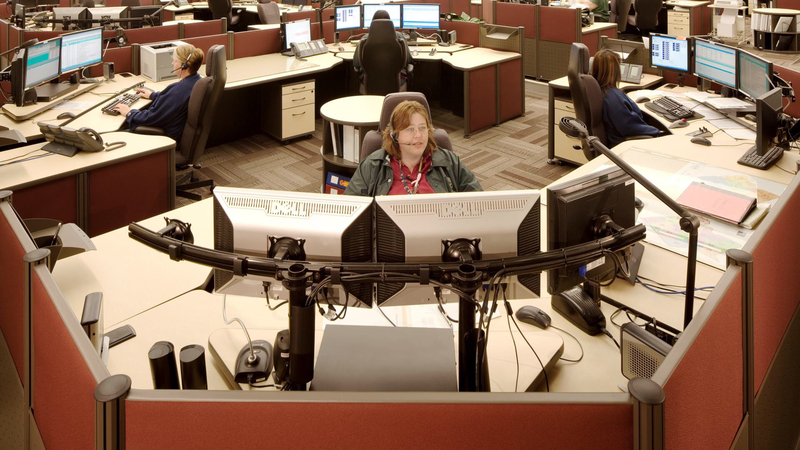 The 911 fees added to residential and commercial phone lines help to fund emergency call and dispatch centers like this one in Gwinnett County, Ga. Photo courtesy of Gwinnett County, Ga. In the early 2000s, a telephone company representative reached out to Roger Schneider and offered him a deal. His internet company could pay less in 911 fees on his multiple telephone lines. A lot less. What the salesperson didn’t know was that Schneider served on the county’s 911 Board. His internet firm was paying 911 charges for 23 lines; a salesperson from a competing company said if he switched, he’d only have to pay for five lines. That would have saved him money, but not the county. The less businesses paid in 911 fees, the less money would come back to the county to fund its emergency call and dispatch center. They looked … they analyzed … and then they sued the company, BellSouth Telecommunications LLC, a unit of AT&T operating in the South. The lawsuit was resolved by a settlement for an undisclosed amount of money and a promise by the phone company, as Schneider put it, “to go forth and sin no more.” Through this and legal action against other phone companies, the county has recovered about $2 million, he said. Nationwide, 911 system operators are being shorted about $600 million a year in fee payments, Schneider said. He now runs a company, Phone Recovery Services, which is working with several counties including in Pennsylvania. Madison County, Ala. was in the vanguard among U.S. counties that are going after telecommunications companies for underpaying 911 fees. Today, counties in several states, including Georgia and Michigan, are suing on the same grounds. In Pennsylvania, Delaware County is suing 19 phone service providers, alleging the county is owed $41 million dollars in 911 fees. Phone Recovery Services estimates 811,698 active phone lines in Delaware County, but telecommunications companies remit 911 fees on only 230,881 lines. That leaves the county with a funding gap of $6.9 million, according to county officials. County Council Chairman Mario Civera has said the companies are shirking their fiduciary duties under Pennsylvania law to accurately bill, collect and remit 911 assessments. “We believe, based on the evidence we have received, that responsibility has not been met,” he said in a statement. More recently, Dauphin County, home to the state capital, sued 22 phone companies for $29.6 million for uncollected 911 fees over a six-year period. Both lawsuits are still making their way through the court system. Cobb and Gwinnett counties are also going after telecommunications companies — both phone and internet. They filed suits in state and federal courts last December, claiming they are owed $50 million in 911 fees from BellSouth, Earthlink and Verizon, and other phone services providers. BellSouth Telecommunications accounts for most of the money being sought, $37.8 million. In their lawsuit, the counties said, “By not billing and collecting all the required 911 charges, BellSouth is able to provide telecommunication services at prices that are cheaper than its competitors, particularly to its business customers.” Cobb and Gwinnett are also suing Comcast Business Communications LLC for allegedly under-billed 911 fees. “It does not impact in any way fees that the courts may rule were due and owing” under existing law, she added. Charles Taylor is a special correspondent for County News. Developing better interactions between citizens and government requires a human-centered approach to problem-solving. Often referred to as “Design Thinking,” the process itself focuses on the experience of the person — “the user” — needing to access a program or service.